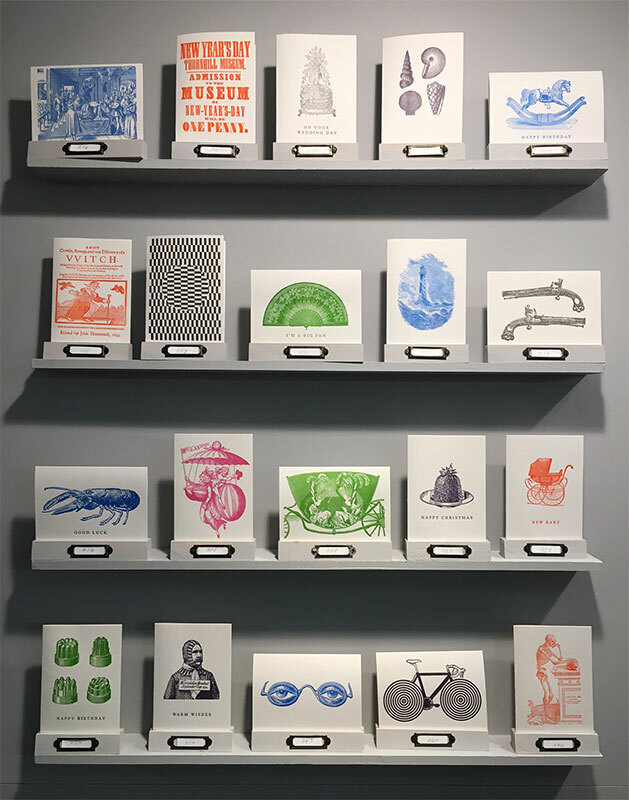 Keyhole Collection cards bring art and history together in hand-crafted letterpress greetings cards which are bold and beautiful, thought-provoking and tactile. Every card gives a new lease of life to images that have been tucked away in archives, museums, library’s and special collections. They show images that may be of small or great importance. Images that give a glimpse of the past with a quirky, contemporary edge. Our designs don’t merely bring you engaging, thoughtful and intriguing greetings cards for any occasion. Each image has a story to tell. Who drew it? Who collected it and why? To find the story behind the image, simply scan the QR code on the back of the card with your smartphone/tablet or type the URL address in to your browser. The link takes you to a page containing a little bit of history and links to the archive, museum, library or stately home it comes from. All of the images are found in places you can visit in person so you can find out even more about their history and other gems in the same collection. Type the URL into your browser. Letterpress is one of the most creative forms of printing. Individual, distinct and physical, every item produced feels unique. It’s all thanks to Johannes Gutenberg. In 1440 Gutenberg revolutionised the way we saw the world by setting up the first commercial wooden printing press. By arranging and inking letters or engravings on a plate and pressing paper against it, books and papers could become available quickly and more cheaply. For 400 years it was the easiest way to share what was important to people. Now Letterpress is making a comeback. A new generation recognising that there is something hugely satisfying in the process and creativity of letterpress printing, the feel and look of the finished article. It is the perfect medium for the Keyhole Collection, breathing new life into age-old techniques and historic images.